Long lost APE cache is found! A group of Seattle-area geocachers has claimed a historic victory against muggle forces by rescuing an APE cache more than five years after it went missing! In 2001, fourteen geocaches were placed in conjunction with 20th Century Fox to support the movie Planet of the Apes. Each geocache represented a fictional story in which scientists revealed an Alternative Primate Evolution (A.P.E.). These geocaches were made using specially marked ammo containers and contained an original prop from the movie. Mission 9: Tunnel of Light was one of those caches. Located about 60 miles east of Seattle, the container was placed by Geocaching HQ co-founder Jeremy and the father of the geocoin, Moun10Bike. The cache was found more than 3,000 times, surviving minor disturbances over nearly 10 years. There is even a Mega-Event (Going Ape) created by the Washington State Geocaching Association to honor this famous cache. 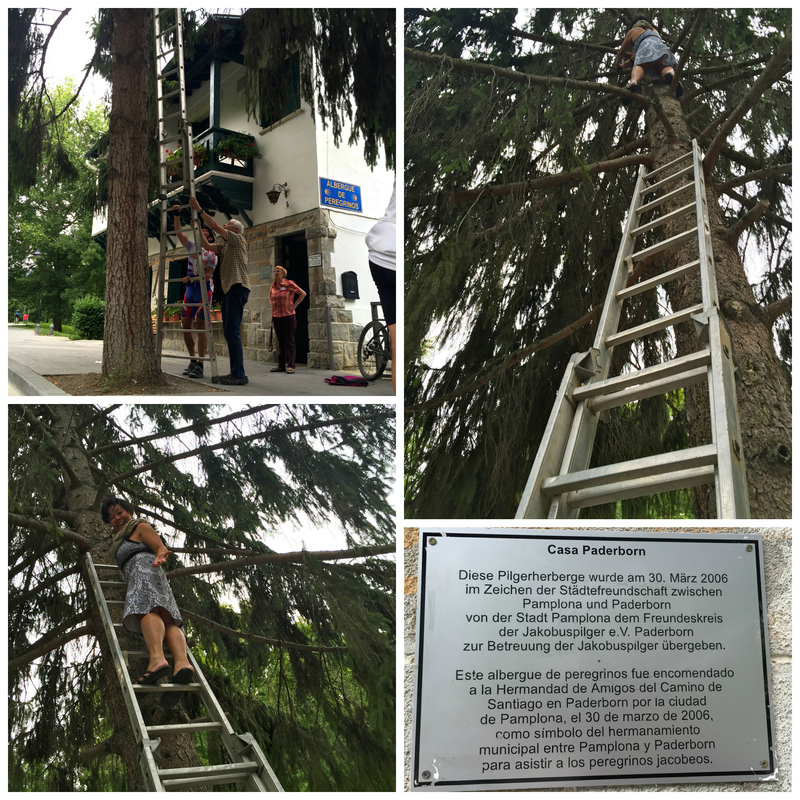 While the community mourned the loss, a tribute cache was placed and the Going Ape event continued each year. But thanks to the incredible efforts of dedicated cachers, there is a new chapter in this APE cache’s story. 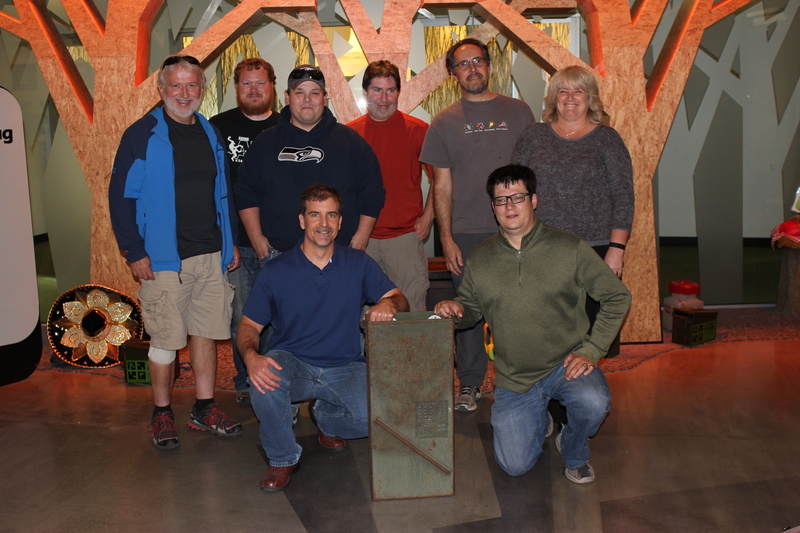 In April of this year, cachers Winos_Seattle and rambudo met up with Geocaching HQ co-founder Bryan Roth. As they chatted, the subject of the lost APE cache came up. Winos_Seattle wondered if the container could possibly be found. Over the years, some have speculated that it’s unlikely that whoever muggled the heavy container would have carried it nearly two miles back to the nearest parking area. Perhaps they simply removed it from its location and discarded it nearby? But even if that were the case, the area is hilly and densely forested. A rescue effort would require detailed planning and keen eyes. Sounds like a job for geocachers! With encouragement from Bryan and Moun10Bike, and after months of planning, the search commenced on October 1. The group of 10 included Winos_Seattle and rambudo, as well as other Seattle-area cachers Sproutter, Lamoracke, _Shaddow_, DSVaughn, Curious Joe, gsbarnes, KnightWolf74 and Princess Trouble. 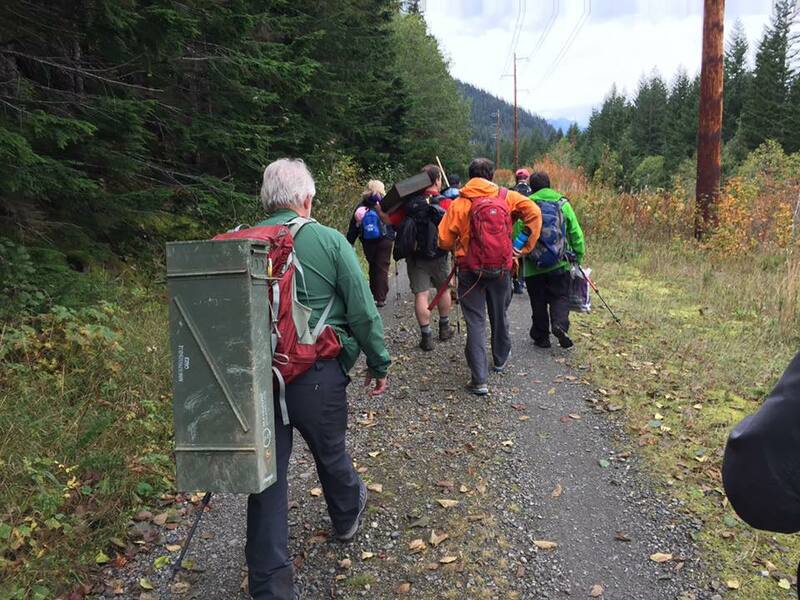 After hiking to the tribute cache, they split into three teams and spread out into the surrounding forest. Equipped with two-way radios, each team was assigned to one of three zones. Within minutes, one team had located what turned out to be muggled tribute cache containers. The other teams found a variety of swag and logbooks, including ones with signatures from 2011 and 2014 (likely from the tribute cache). Following an extensive and courageous effort, a joyous call eventually came over the radio, “We think we found the original container!” Down in the woods below the original cache location, behind a tree with the open end of the container facing down, was the Mission 9: Tunnel of Light cache. Distinguished by stickers affixed to the inside, as well as some Planet of the Apes trading cards, the cache had fared remarkably well over the years. After a lot of celebratory high-fives, the group phoned Moun10Bike, who was shocked and delighted by the discovery. A couple days later, Moun10Bike, Bryan, and others at Geocaching HQ welcomed the triumphant searchers and the long-lost APE cache. And now that the container is recovered, we’re left with an important question. The triumphant search party hiking out with the APE cache. Photo by DSVaughn. The Planet of the Apes caches enjoy a special place in geocaching lore. Today, only one active APE cache remains: Brazil’s Mission 4: Southern Bowl. 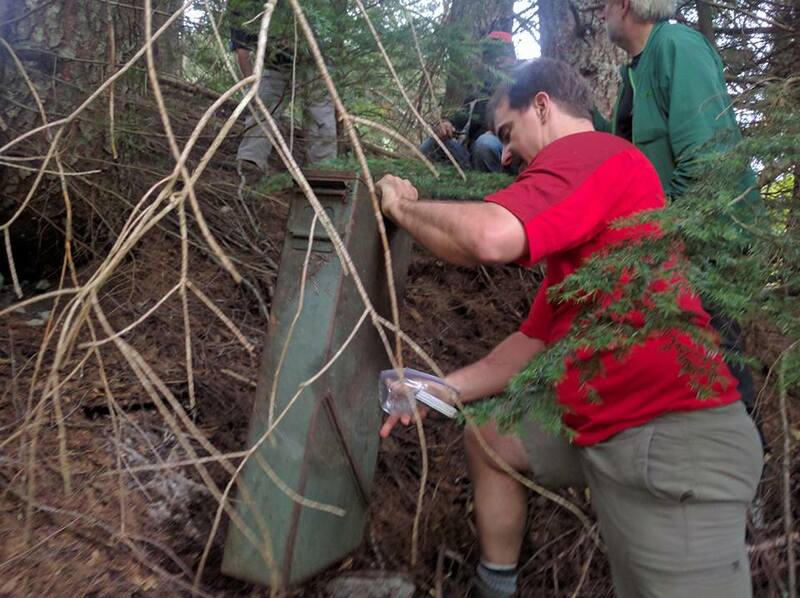 Given how the global geocaching community treasures the APE cache series, we feel it’s very important to hear what you think should happen next. Bryan and Moun10Bike examine the APE cache container. Photo by Love. Should Mission 9: Tunnel of Light be returned to its original location and reactivated? Should it be kept safe from muggles and instead be displayed at Geocaching HQ as an artifact of the game’s history? Are there other ideas that should be considered? We encourage you to make your voice heard by completing this survey by November 27, 2016. (Note: The survey is now closed, so we’ve removed the link from the blog) We’ll gather the ideas and later give you a chance to vote for your favorite in early 2017. In the meantime, please join us in reveling in the knowledge that what once was lost has now been found. Congratulations and thank you to everyone who made it happen! Several members of the search party at Geocaching HQ. Photo by Love. 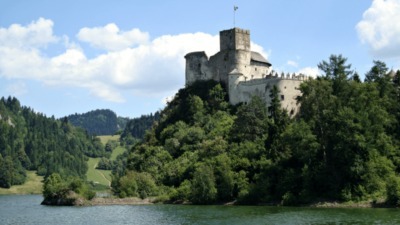 Have you ever wanted to go on a pilgrimage? 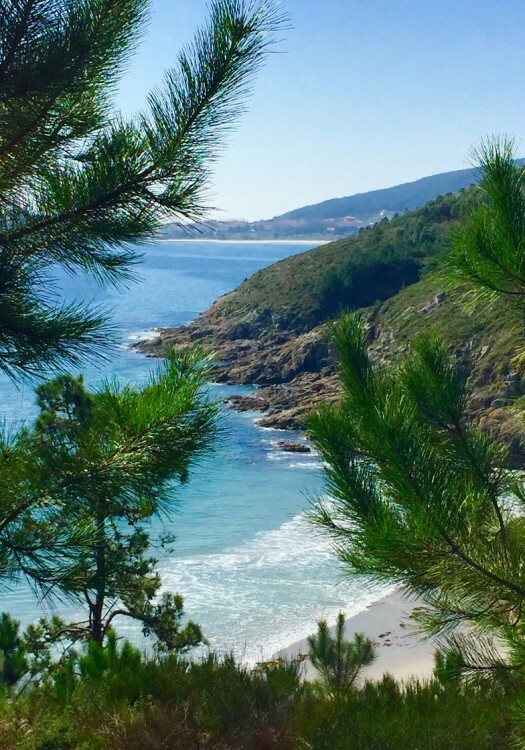 Just as summer turned into autumn, I was fortunate enough to walk across Spain. Literally. 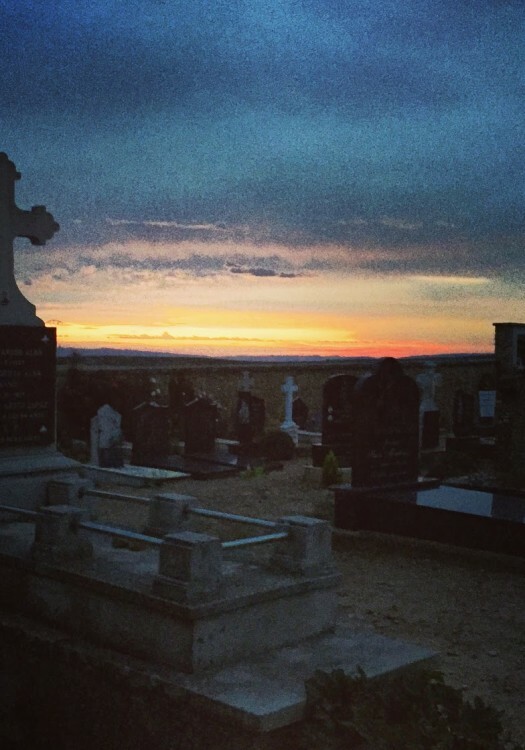 Those 1,043 km took me over 3 mountains, flat through 7 days of the exquisite meseta (plateau), and across more than a thousand years of Spanish Catholic history. Those kilometers also brought me conveniently near several remarkable geocaches. And bonus: two new country souvenirs! 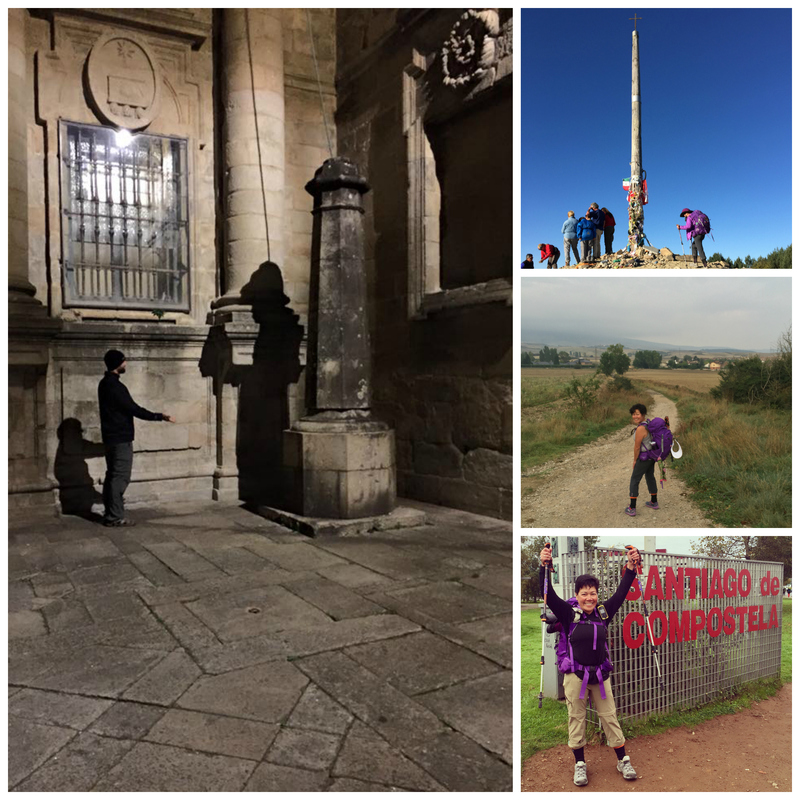 This pilgrimage is called El Camino de Santiago. I began my 38-day walk in the misty French town of Saint-Jean-Pied-de-Port, nestled in the foothills of the Pyrenees. Although I had gotten a late start that morning, I still walked against the pilgrim traffic towards the cache at La citadelle to earn my France souvenir: magnifique! Later that day, I walked from France into Spain, over the Pyrenees. 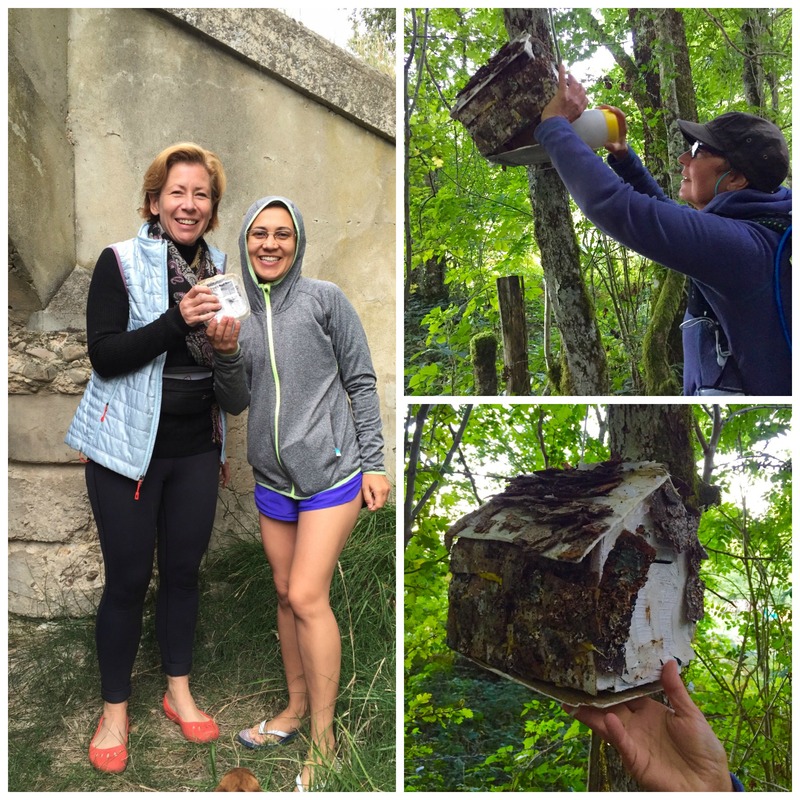 Clockwise from left: Karin and Milene find a cache together. Amber finds her 1st geocache. On the second day, my new friend Amber asked me what this game is all about. 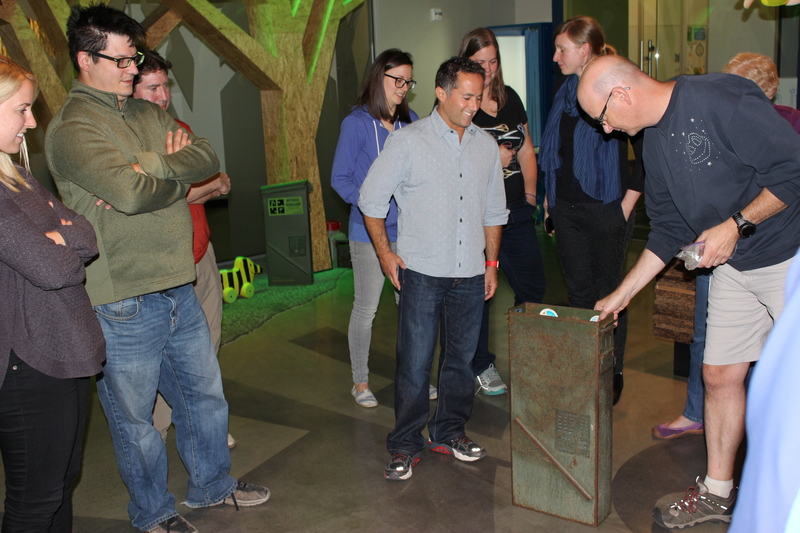 The best way to explain geocaching is to show it, of course! 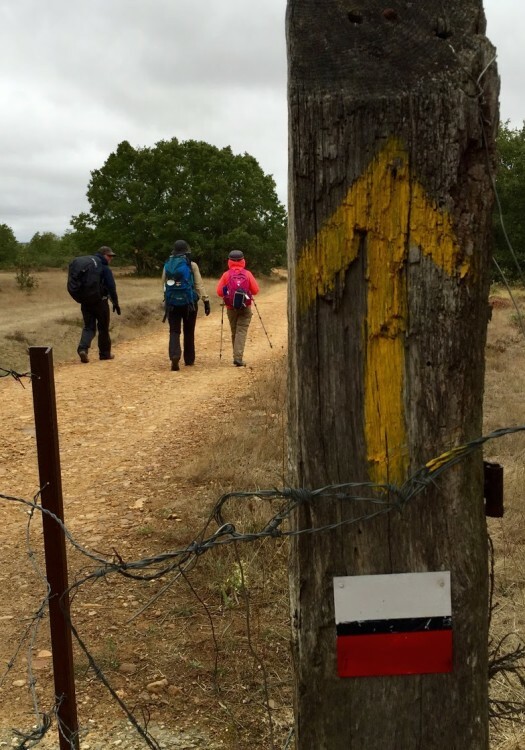 At first, we DNF’d at Caminante No Hay Camino… which is ironic given what that cache title means. 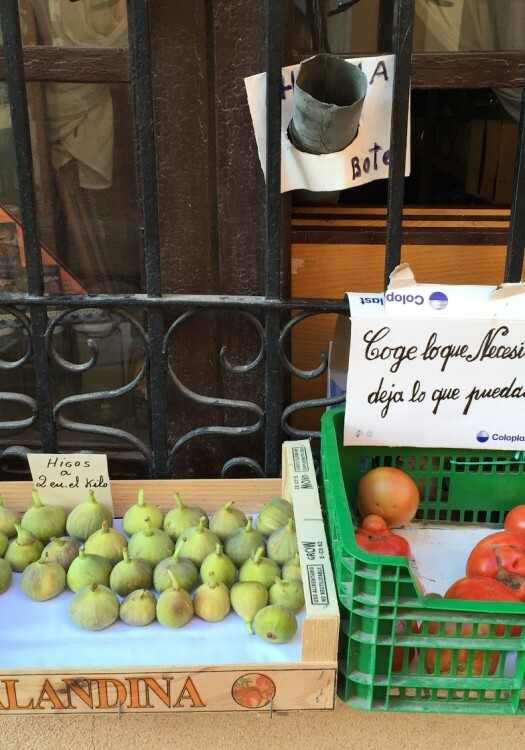 We found success at Brujeria – Sorginkeria – maravilloso! – and only because this Dutch woman also speaks Spanish and helped me understand that the hint (pío, pío) is about birds: something not immediately obvious to a non-native Spanish speaker like me. Amber’s first find had a very creative container, and we secured that additional country souvenir. Walking farther west, we stumbled upon a German-style T5 experience at Casa Paderborn, Pamplona: märchenhaft! I estimated the cache height to be some 21 feet or so off the ground, well beyond the 14-foot ladder I borrowed (a ’14-foot ladder’ is probably called something different in a place where they don’t measure things in feet.) My pilgrim friends and 10 cyclists who happened to be resting below the tree did not understand what was happening. Even I was pretty amazed that WAY UP THERE is where my day went, in a dress, no less. They asked me from the ground: ¿Qué encontraste en el contenidor? What did I find in that container? Adventure and a great story to tell, that’s what. 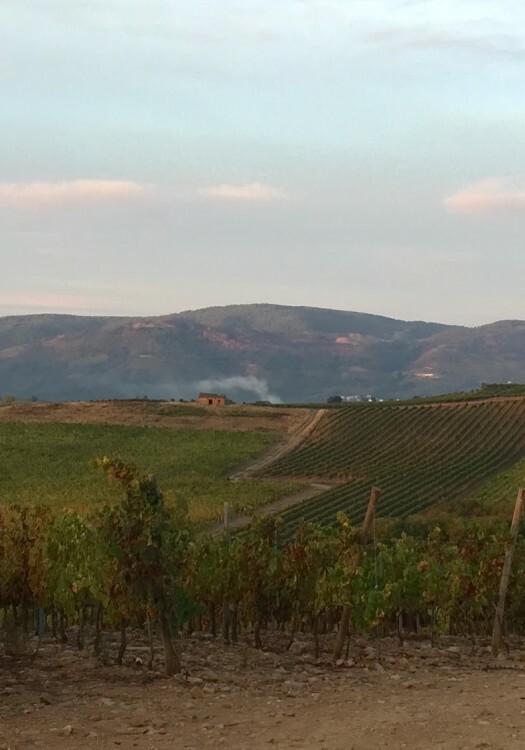 The Casa Paderborn, Pamplona cache brought me additional joy because I had helped to develop the Paderborner Land GeoTour in Germany. This pilgrim hostel and this geocache both represent a sisterhood between the city where I was and a city that hosts a GeoTour! My worlds were coming together in delightful, mathematically unlikely ways. German-style T5 experience at Casa Paderborn, Pamplona. 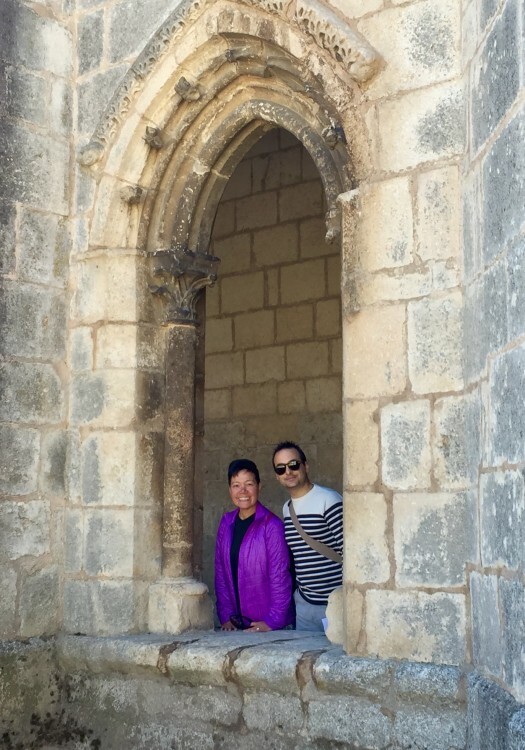 By the time I got to La Cruz de Hierro, I was in my 4th week of walking. 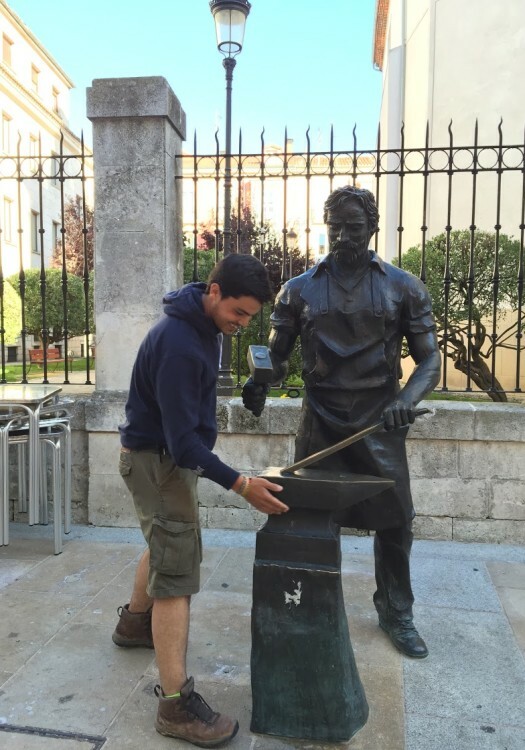 One of the most significant and powerful moments along the pilgrimage route, I had every intention of finding this geocache as a personal milestone. As it turned out, the significance and power of the moment itself caused me to forget about all about geocaching; instead my thoughts went to so many other far-off places. I recorded that as a memorable DNF since I had intended to find it and once within a few meters of the cache, I simply forgot to look. Has that ever happened to you? 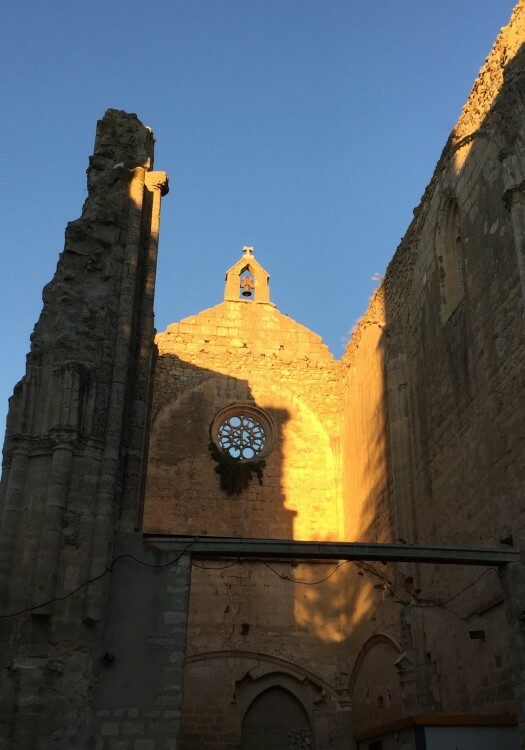 Right outside the cathedral at Santiago de Compostela is a shadowy geocache called A sombra da Quintana de Mortos. Finding it at night when the lights are on makes for the best experience: architectural factors at the location combine, creating the magical illusion of a pilgrim forever tethered to the cathedral walls. It’s quite an improbable combination: the bumps on the cathedral walls were built independently of the simple pillar that creates the shadow. Further, the electric lights were added hundreds of years later. This is not something included in a typical guidebook. This is something I found only because of geocaching. Clockwise from left: Sombra with Hans photo by Suzanne, MissJenn walking to the Cruz de Ferro, Walking the Camino, At the finish. Signing each of those geocache logs reminded me how geocachers have more than just geocaching in common. 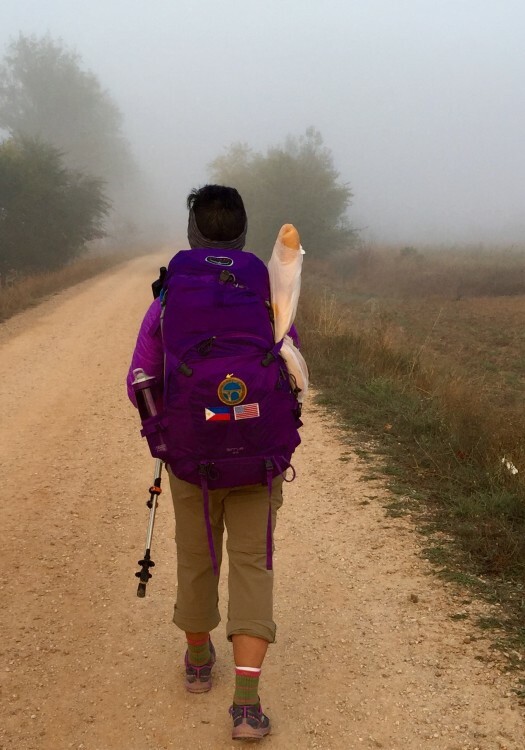 My stories intertwined with other pilgrims’ narratives as they each made their way one step at a time towards the city of Santiago de Compostela just like I did, but differently than I did. For example, the logs show that Dauby had started in Prague while I started walking just over Spain’s border with France. I read that the Canadian 3 Bearss were pawing through caches, always just a few days ahead of me. 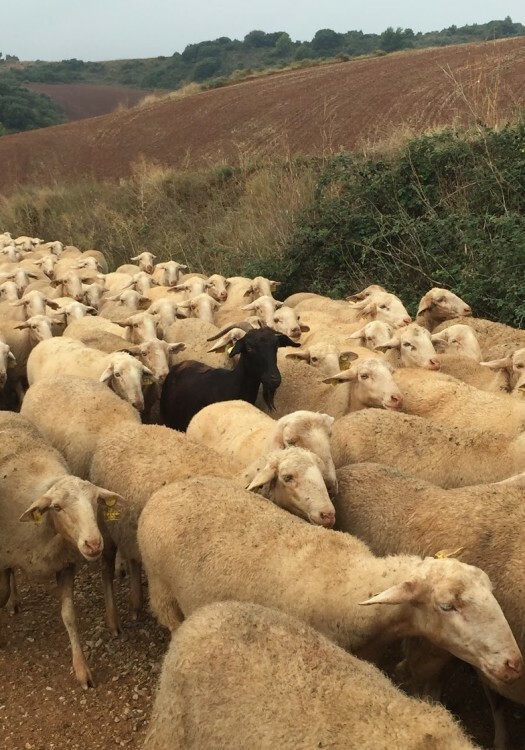 I actually met Maltese superprizz in person in Burgos (at a cache owned by my friend and Community Volunteer Stitch81) and we must have had very different paces since we didn’t run into one another again. Stitch81 himself had walked his own Camino many years ago, and he gave me sound advice and helped me with critical provisions. 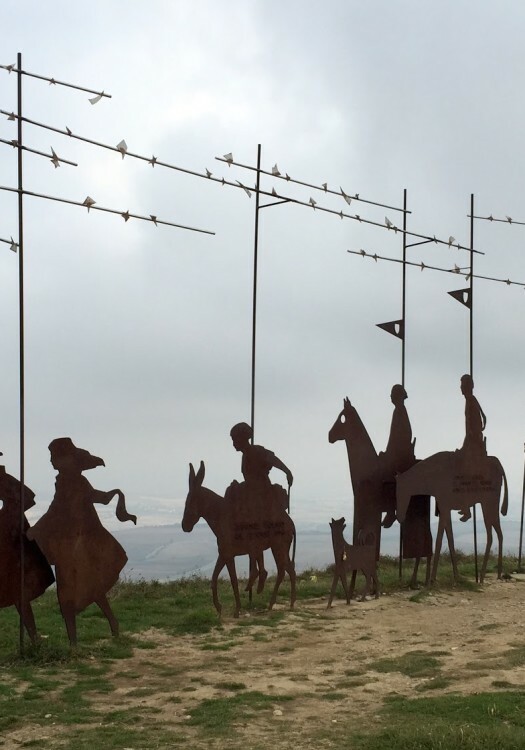 It will take me ages to process all my many stories about this awe-inspiring, multi-faceted experience called El Camino de Santiago. At least I have now told you about some of the caches that helped make it an even better adventure. What is the longest distance you have walked while geocaching? “Buen Camino” is the traditional wish and sometimes a goodbye for all the pilgrims. 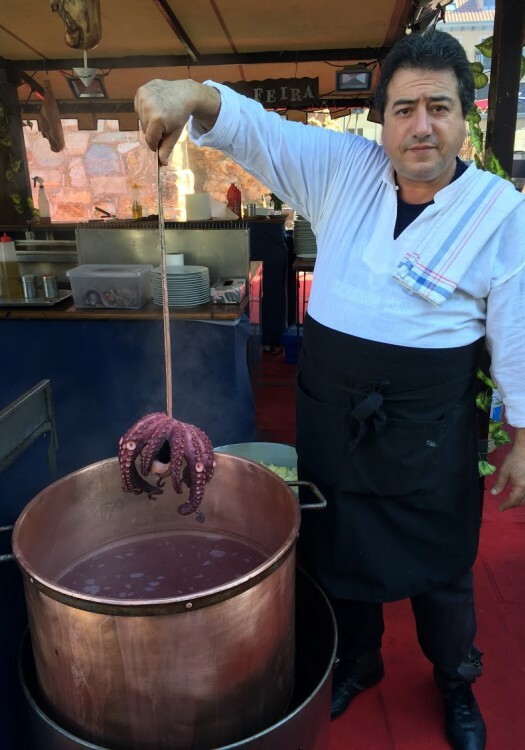 Octopus: that’s what’s for lunch! So delicious when prepared with special spices and a bit of olive oil. 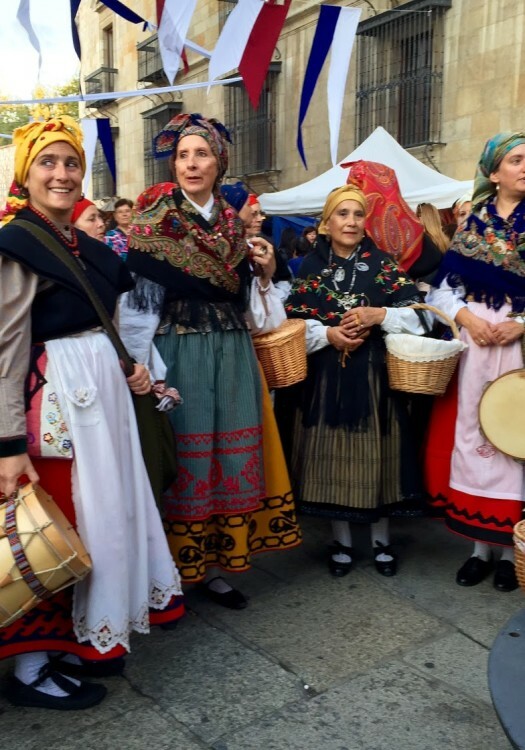 Festival dancers all dressed up await their turn on stage in León. The exquisite meseta is not all flat. This long hill gave me quite the heart-pumping climb. 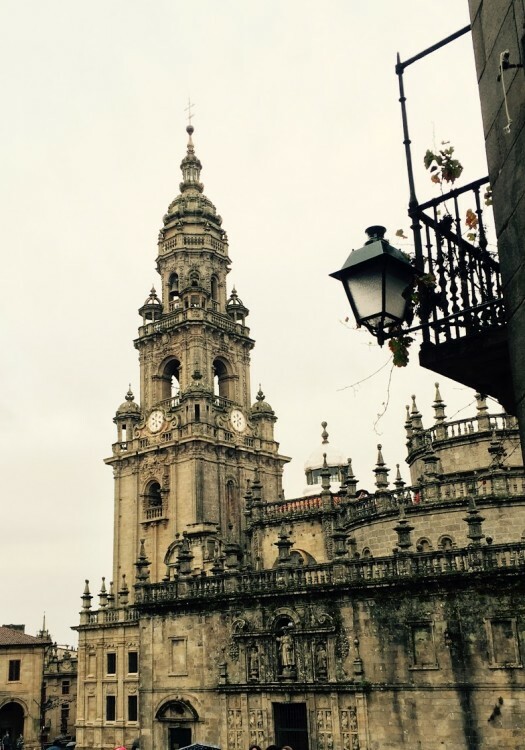 View of the Cathedral at Santiago de Compostela, where many pilgrims end their journey. 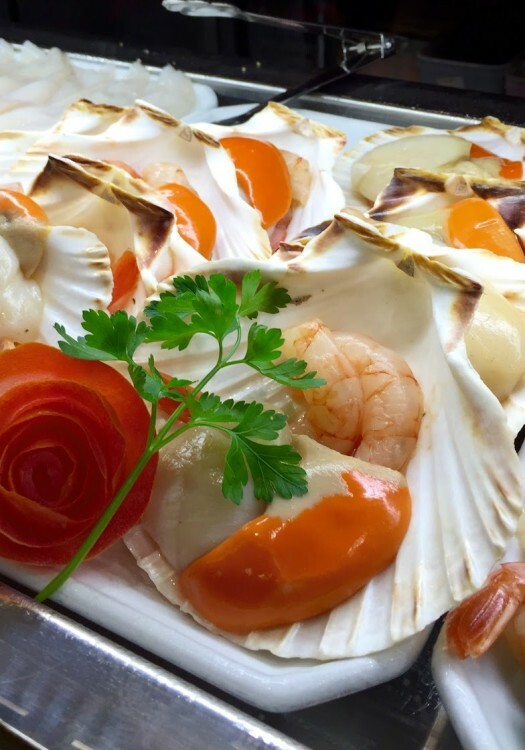 I sat at a tapas bar and enjoyed super fresh seafoods like scallops with shrimp, grilled to order. One of my first views of the sea as I approached Finisterre. Metal sculpture at Alto del Pérdon, altitude 790 m and very, very windy. 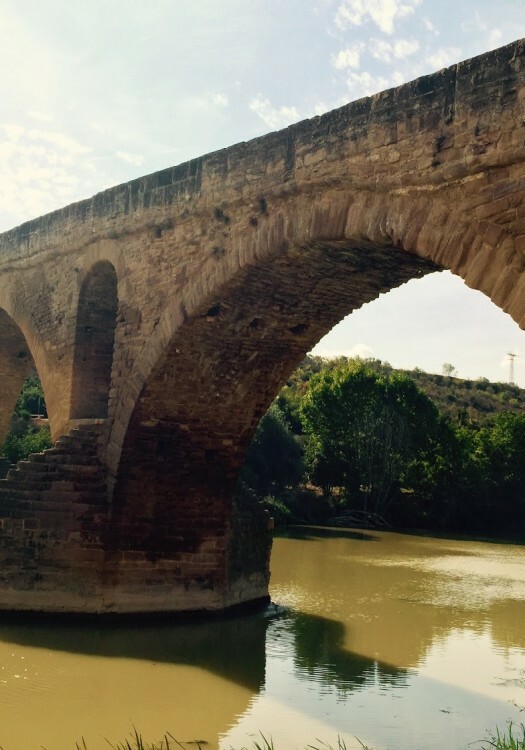 This bridge, Puente de la Reina, was constructed by Queen Doña Mayor in the eleventh century so pilgrims would have an easier time over this wide river crossing. Abandoned boots make a good flower vase and comic relief. Traffic jam: I had to wait for thousands of sheep (literally) to pass before I could continue. One of many sunrises I greatly enjoyed along the way. 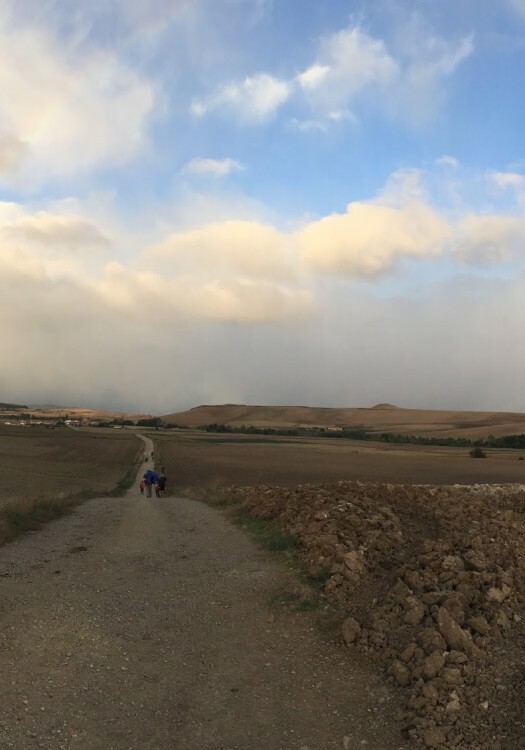 We were graced with a double rainbow as we entered Castilla y León. 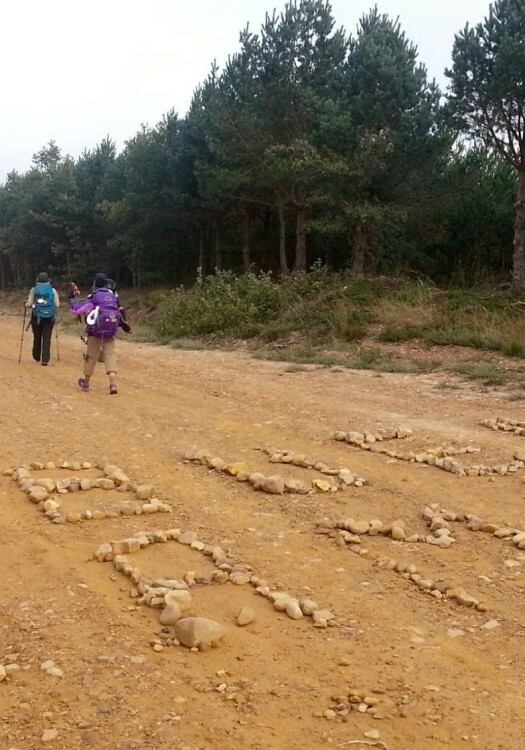 Yellow arrows mark the Camino. 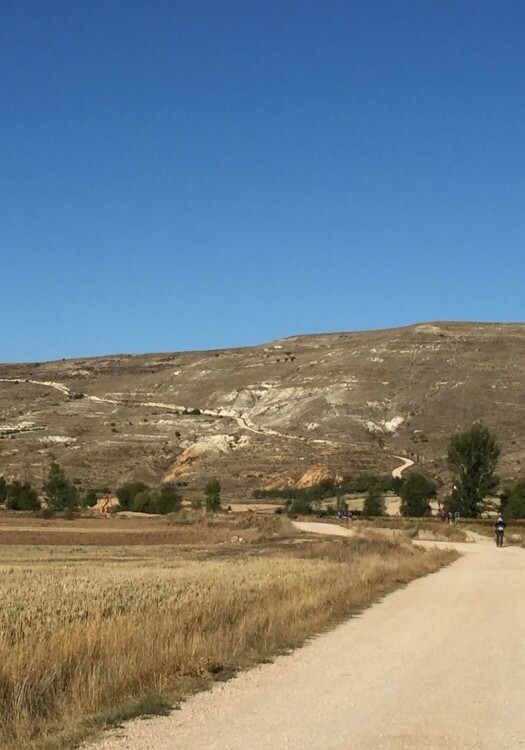 The white/red blazes identify this specifically as the Camino Francés. 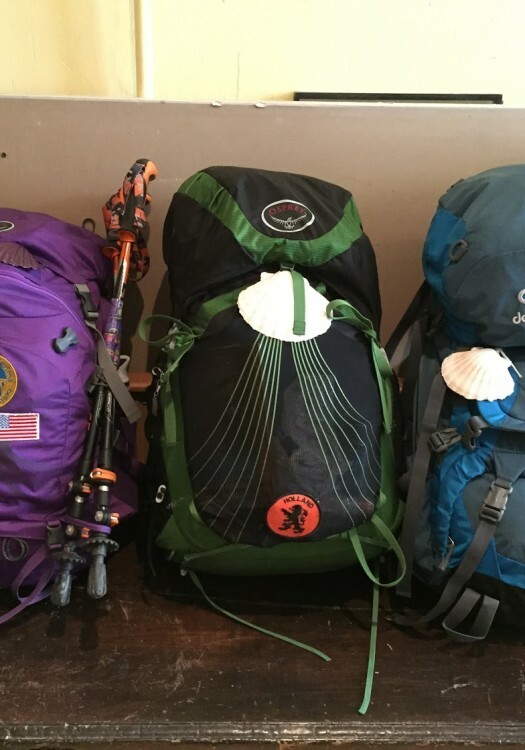 Backpacks from a Philippine-American, a Dutch woman, and a Swede, each with a scallop shell symbolising the Camino. 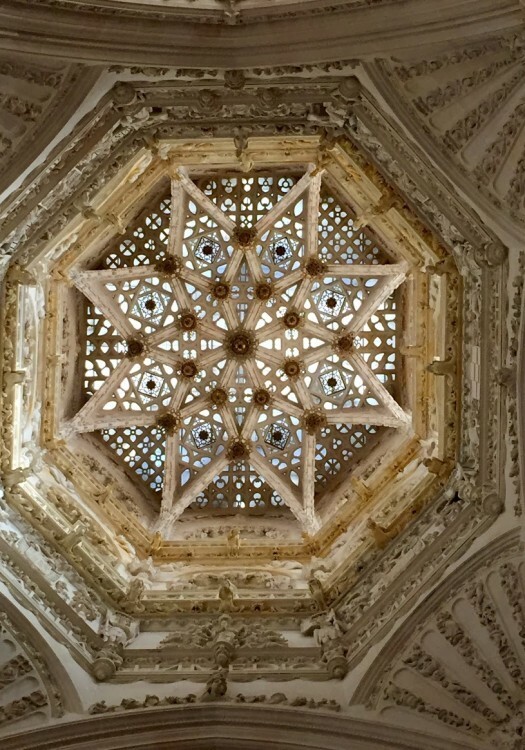 Gorgeous window at the Cathedral in Burgos, a UNESCO World Heritage Site. I left several MissJenn trackables that can be adopted by the people who find them. 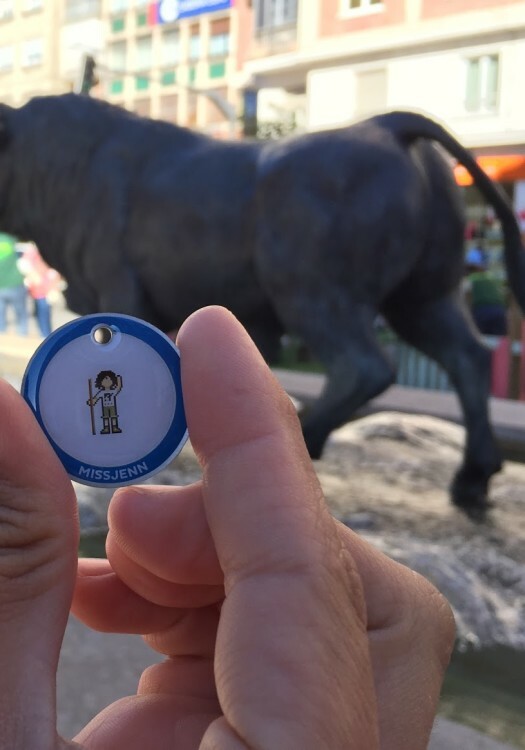 superprizz from Malta finds a geocache in Spain with a new friend from Seattle. Some days the walk took me right past the grapes in one vineyard after another. Tasty! Not many people would choose to visit Alaska in December. 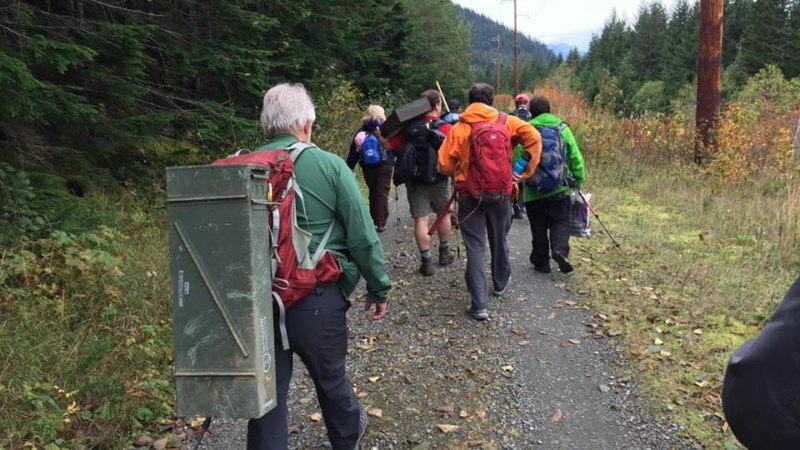 But that didn’t stop a group of nine Geocaching HQ Lackeys and friends from spending 24 hours visiting the capital city of Juneau. I feel fortunate to work with such amazing people who don’t think twice about spending their own money and giving up their weekend for a fun geocaching adventure. With a cheap flight and our sense of adventure, we took off early on a Saturday morning for a 24-hour geocaching journey. The only way to reach Juneau is by plane or boat, as there are no roads that lead to this isolated part of Southern Alaska. Our plane descended into Juneau at sunrise treating us to a spectacular view of seemingly endless white capped mountains. Upon arrival we picked up our two SUVs and took off on our adventure. Within minutes we were stopping at our first geocache. 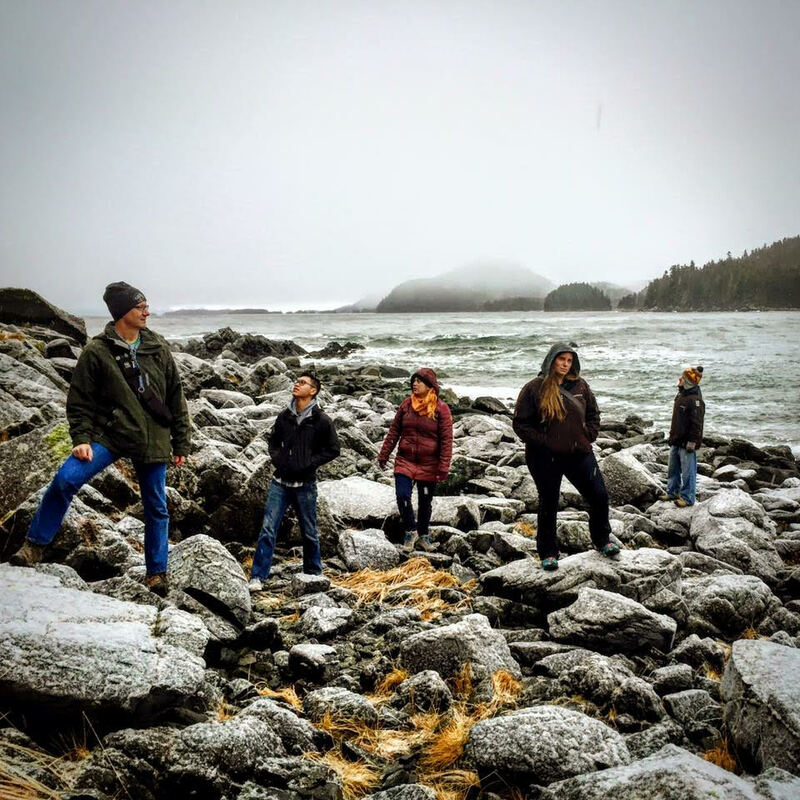 The setting: a lifting fog on a beautiful wildlife refuge surrounded by mountains. 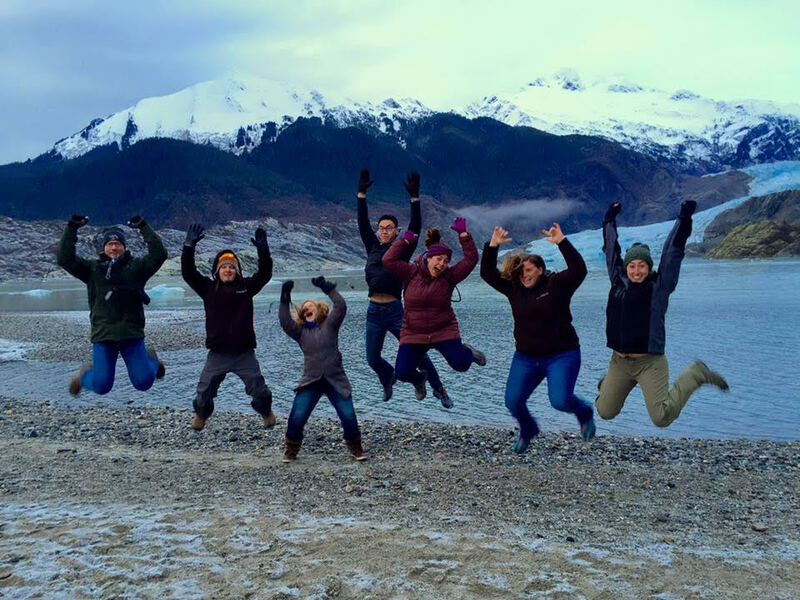 We couldn’t have asked for a better introduction to Alaska. 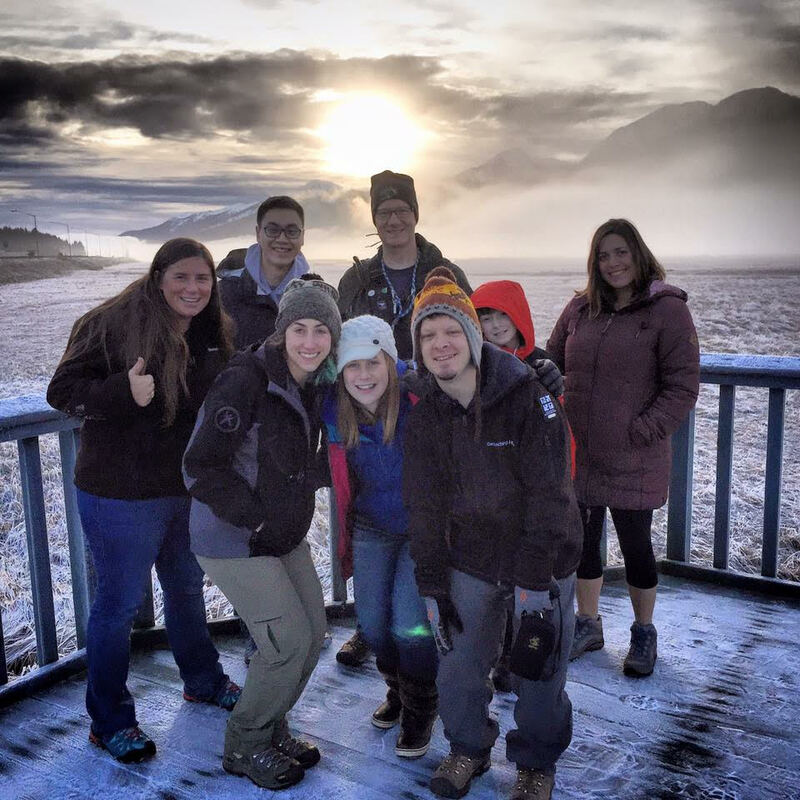 After a tasty breakfast, we set off for one of Juneau’s top tourist attractions: Mendenhall Glacier (a 13 mile long river of ice). This place is unreal. If you ever get a chance to travel to Alaska it’s well worth the visit. It’s also a great place to log several EarthCaches and learn about the interesting geology and history of the area. Local geocacher Avroair (Mark Clemens) was hosting an event at the Visitor’s Center to celebrate his accomplishment of finding caches in all 50 states. 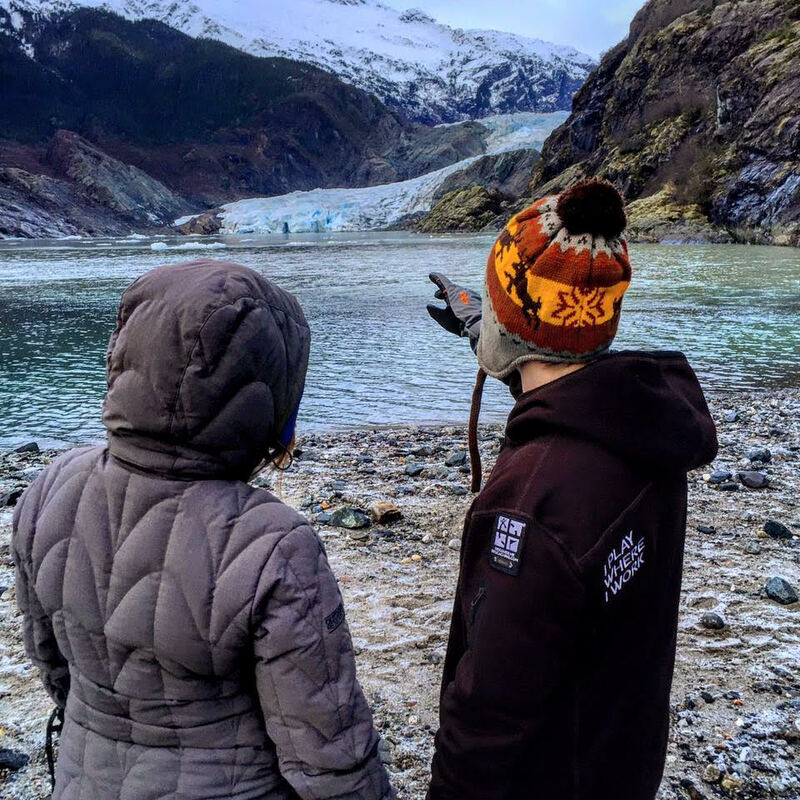 Our group of nine met up with a handful of local geocachers and enjoyed talking about our hobby while taking in the amazing view of the glacier. 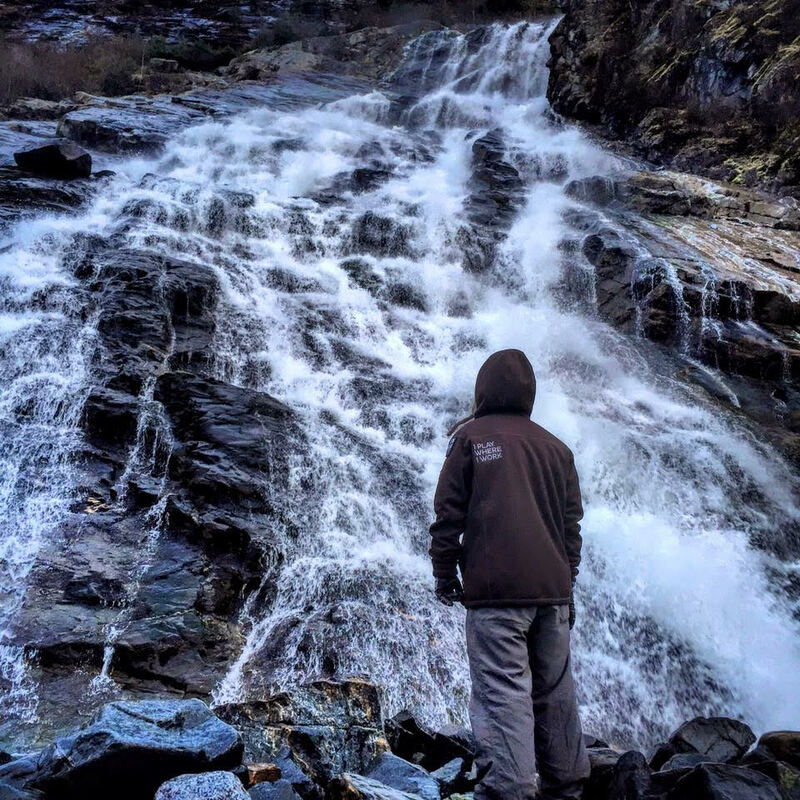 We then took off on the one-mile nature walk to Nugget Falls – an impressive nearly 400-foot tall waterfall. We posed for some silly pictures in front of the glacier. Lucky for us, one of the local geocachers is a long time employee at Alaskan Brewing Co. We got our own behind-the-scenes tour of the brewery while sampling the local beer. Naturally, there was a geocache in front of the brewery that we had to find before starting our tour. Our very long day ended with a dinner event with even more local geocachers. Since it was a nice small group, we were able to have some great conversations and really learn a lot about the area and the local geocaches. 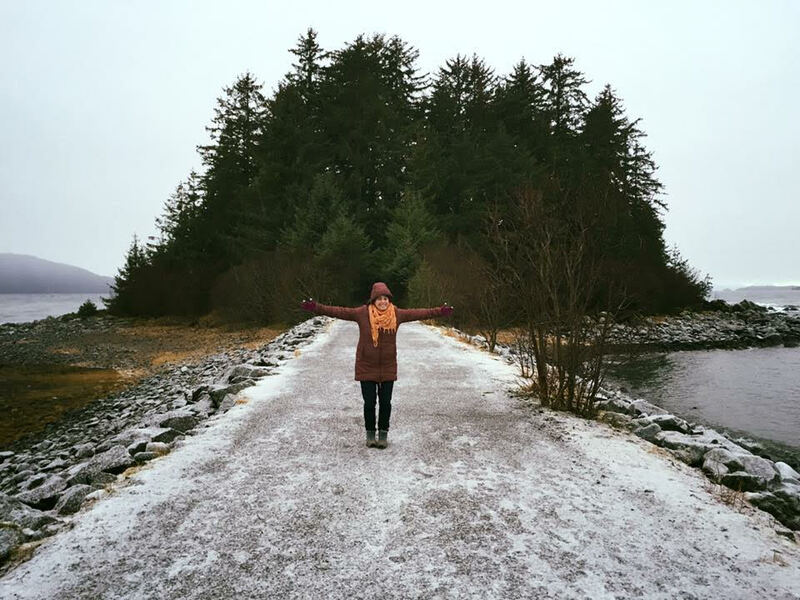 We barely scratched the surface of the great geocaching Juneau has to offer and I was inspired to return someday – hopefully next time in the warmer summer months! See Annie Love’s Geocaching journey atop Mt. Fuji. Where do you want to take a Geocaching journey? About 4 hours from Geocaching HQ in Seattle, sitting atop Liberty Bell Mountain is Tensegrity on Liberty (GC1G5BY), the oldest unfound geocache in Washington State. The reason it remains unfound? It’s a Difficulty 5, Terrain 5 geocache that requires a long hike, a scramble and 400 feet of fifth-class technical climbing. In our new video, Geocaching HQ’er Derek, along with a muggle friend, attempts to be the FTF and earn the new Geocaching Road Trip ‘15 Let’s Get Extreme souvenir. You’ll probably recognize him from some of our other videos, but outside of (trying to) act and writing things for Geocaching.com, Derek is an avid rock climber. Watch the new video to see if they make it. Inspired to find a T5/D5 geocache? Visit the new geocache search page to find one near you. 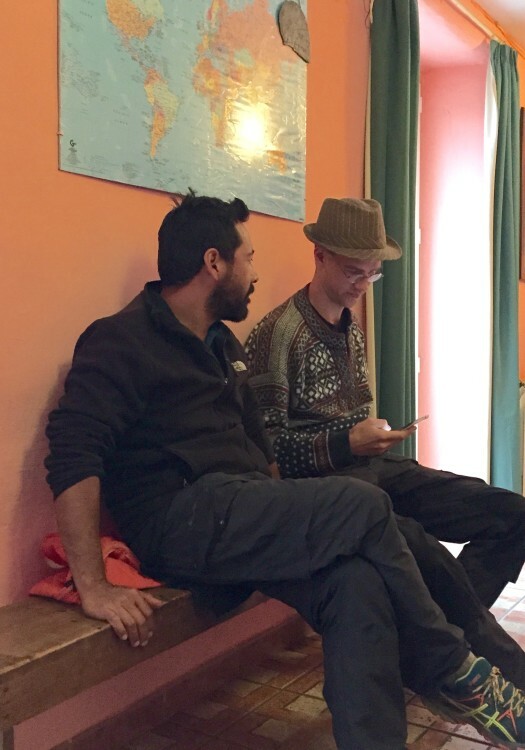 Anfang dieses Jahres folgte das Videoteam des Geocaching-Hauptquartiers einer Gruppe von mutigen Geocachern bei einem bisher einmaligen Unterfangen. Ihr ultimatives Ziel: den schwierigsten EarthCache der Welt zu finden. Das Video ihrer Reise ist jetzt fertig. Schau es Dir hier an. EarthCaches sind aus einer Partnerschaft zwischen Geocaching.com und der Geologischen Gesellschaft der USA entstanden. Es gibt dabei keinen gegenständlichen Behälter. Dafür vermittelt der EarthCache Dir eine geowissenschaftliche Lektion. An den angegebenen Koordinaten müssen Fragen beantwortet werden, um einen Fund zu loggen. Schau das Video an und folge diesen begeisterten Geocachern auf ihrer Reise zum Mittelpunkt des EarthCaches. Du hast jetzt zwei weitere Tage Zeit, um das CITO-Souvenir für 2015 zu erhalten. Zwischen Freitag, 24. April, und Montag, 27. April, bekommst Du das Souvenir für die Teilnahme an einem CITO-Event. Durch CITO (Cache In Trash Out) [Cache rein, Müll raus] erhalten Geocacher ihr Spielfeld, also die Erde, in einem großartigen Zustand. 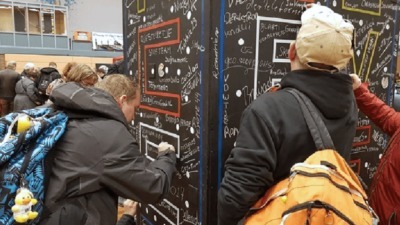 CITO-Events sind Treffen, bei denen Geocacher Müll und eingewanderte Arten entfernen, Wege bauen und Gebiete restaurieren. 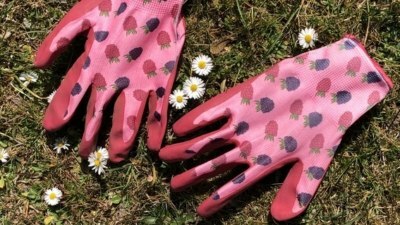 Finde ein CITO-Event in Deiner Umgebung und logge Deine Teilnahmeabsicht.